The mass marketing of powerful micro PCs such as the Raspberry Pi brings low cost, computing power to technical professionals and hobbyists alike. Suitable for most field installations, they also provide an excellent training and experimental platform for individuals interested in controls and automation. Contemporary Controls, committed to open controls, is contributing to this effort by offering low-cost controller products under the BASpi name which incorporate BACnet for communication and Sedona for control, and are powered by the Raspberry Pi. 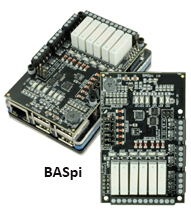 The BASpi I/O board is a 12-point BAS expansion board for the Raspberry Pi 3. The I/O board, plus the firmware files provided by Contemporary Controls turn your Raspberry Pi into a BACnet-networked, Sedona-programmable controller with 6 universal inputs and 6 outputs. The universal inputs can be configured for binary, analog, thermistor, resistance, or pulse inputs. In addition to 12 physical I/O points there are 24 virtual points – all configurable as BACnet points. A total of 48 web components are usable for configuration points accessible via a common web browser. Communication with the BASpi is via 10/100 Mbps Ethernet or Wi-Fi. "The rise of the DIY (Do-It-Yourself) maker movement has spawned the creation of collaborative work spaces, either physical or virtual, where like-minded individuals can gather to explore, innovate, collaborate, and share their ideas back to the maker community. This DIY revolution is certainly boosting innovation in many fields as well as helping to prepare the next generation of makers today, who will need the critical STEM skills (science, technology, engineering, and math) for the automated world of tomorrow," says Zach Netsov who is a Product Specialist. "Contemporary Controls supports this DIY maker community with open building automation products built on open software and open hardware, as well as an automation blog that I produce." Visit the BASpi product page to learn more.